Our clients are often beginners in this field. They need to understand how the social media world works, the basics, and what to start with. The second reason is that the social media industry is constantly developing, improving, and changing. You need to keep your social “finger” on the pulse to understand how different your strategy will be the day after tomorrow. I started writing for the Academy almost a year ago. But when I started researching the topic of “how to promote your blog”, I just wasn’t finding a whole lot of ideas with real how-to, actionable advice that would really help me find the best blog promotion tactics for PromoRepublic. 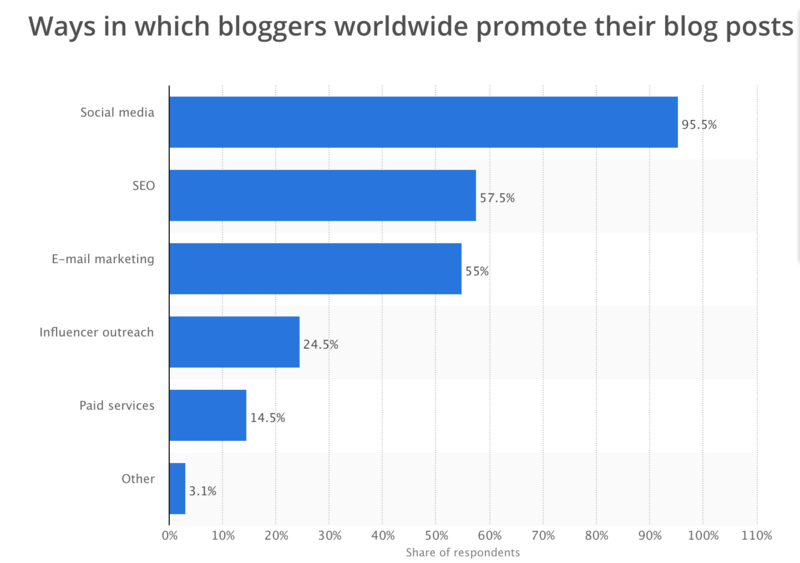 Statista says there are 5 proven ways in which bloggers promote their blog posts. I do agree with them, as this tactic has been proven in my content team as well. Before I start sharing the tactics I use here at PromoRepublic, I want to support my suggestions with proof. This is a comparison of our blog analytics. The difference is in 2 months. You can see that we stabilized regular traffic to the blog and increased it more than double. Before we start discussing how to promote your blog post and how to define best time for publishing, please, take a look at your page profile. If it is missing the link to your blog – add it immediately to the about section. Even if you use Facebook predominantly, don’t neglect other networks. Did you know that Twitter is number one for link sharing? With PromoRepublic it is very easy to publish on several networks simultaneously. All you need to do is just prepare the blog post, choose the visual, write a caption, and attach the link to your blog post. No, you shouldn’t publish the same post 3 times a day, but it will be nice to schedule your best and evergreen pieces of content twice a week, for example. You will not be spammy, but you will definitely increase traffic to your blog. My piece of advice for you is to create an editorial calendar. Take a look at this Twitter post by Amanda MacArthur. She says that she schedules one blog post 12 times for 12 months. In such a way, you get “fresh” traffic for the whole year! I haven’t tried this practice yet, but I definitely will! Promote your best posts. Imagine, you have a great post published on Facebook 3 months ago. Now, publish it on Twitter today! Again, it’s very easy. 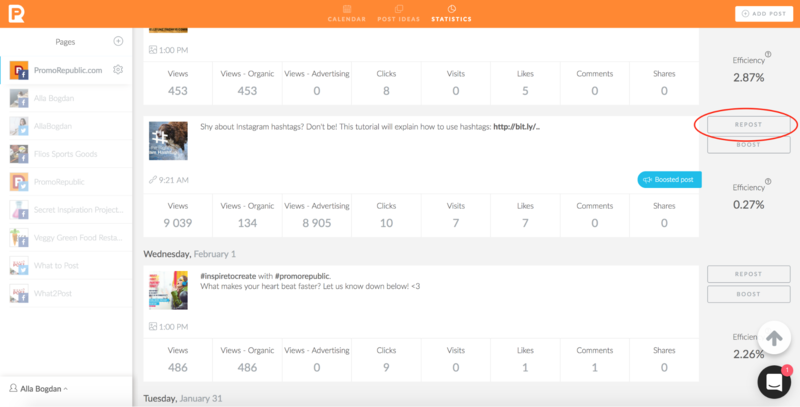 PromoRepublic’s repost feature allows you to republish any type of content to any social network anytime. If you have decided to publish your blog post more than once, why don’t you change the caption to it? By the way, you can also experiment with visuals. If you quote influencers in your blog posts, reuse that inspiration in your social messages. Don’t forget to tag them and ask for a re-share. Headlines you write for your blog post may work even better than the title itself. Use them for your followers to understand what they should expect when they read your blog post. You can change description of your blog post. Posts with only titles or bare links are not as engaging as the posts where you interact with your readers and encourage them to read what you have prepared for them. GIFs are becoming more and more popular visual type of content. 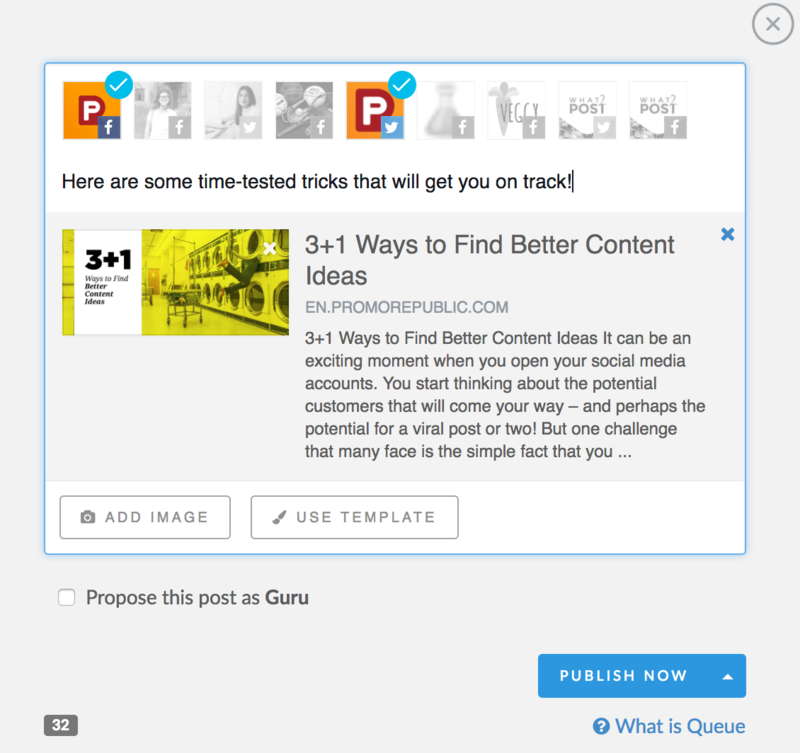 Use a GIF instead of static image and boost number of your post clicks. You can learn how to create your own GIF here. 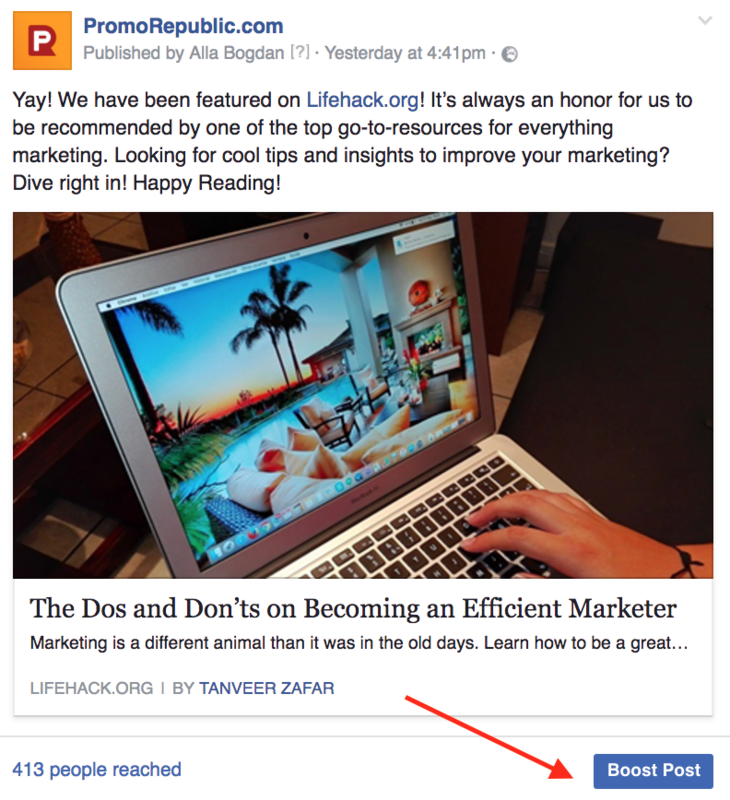 Facebook makes it very easy to boost posts you want larger audience to see. Even if your content is unique, visual is catching, and the caption engaging, a very small part of your followers and their friends will see it. With correct targeting, you will increase your chances to get more engagement and traffic to your blog. You can learn how to boost posts on Facebook here. Choosing several Facebook groups to engage with will help you target niche audiences that you may not reach otherwise. Not all of the people in the group will be fans of your page yet, so not only can you reach people outside your existing network, you can gain new fans and followers, too. One thing to note – Facebook groups hate anything they could construe as spam, so make sure you do several things before you start posting. First, make sure you engage with other people’s posts. Second, get permission from the group’s admin to post your link. Third, make sure your headline and description communicate the value of your post to the people in the group. Finally, make sure you include an eye-catching image. You can do that in PromoRepublic, as I’ve said, and really wow a whole new group of people. Hashtags are everywhere now, and they provide a great way for people to find content that interests them. You can use hashtags on Facebook, Twitter and Instagram to provide relevant content that people see. Choose your hashtags wisely, and don’t use too many, or your post will look spammy. Just like it’s important to engage with Facebook groups, it’s also important to get to know other people in your industry and related industries. When you write a blog post that has content that might interest their network, you can leverage your relationship with them to promote your content. Just don’t abuse this privilege, and make sure you reciprocate when they ask you to share their content. Sharing your content often enough and partnering with the right people who will help you promote your content will go a long way toward getting your blogs seen! Alla, awesome webinar, I don’t get on much to join in but finally caught this one. Awesome , webinar and i hope i get to catch up with others. 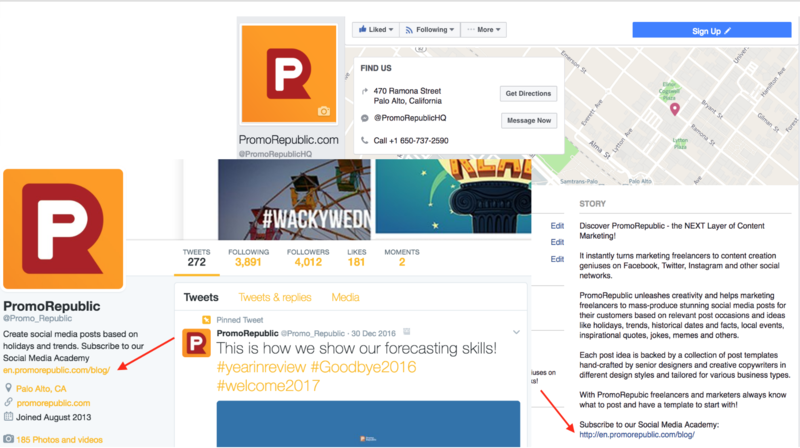 As a social media marketer myself, i can wholly recommend promo republic.